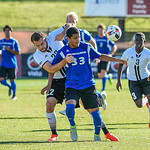 The Summit League Tournament Semifinal soccer game between Omaha and Eastern Illinois at CIBER Field on the campus of the University of Denver in Denver, Colorado. 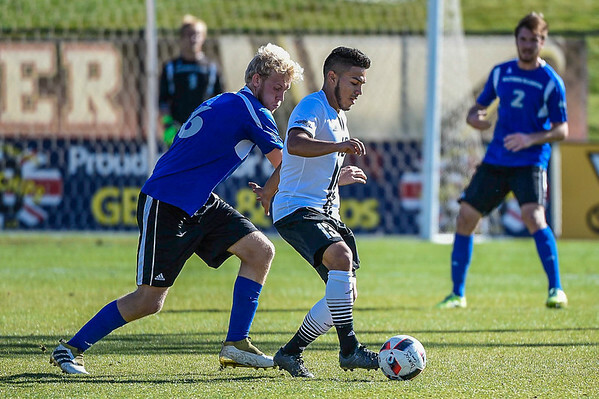 Final score of the game was Omaha - 3 and Eastern Illinois - 1. 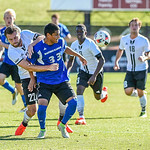 November 10, 2016, Denver, Colorado, USA; Nebraska Omaha midfielder / forward Lalo Gamboa (13) putting himself between Eastern Illinois defender / midfielder Anton Olsson (6) and the ball during the Summit League Tournament Semifinal soccer game between Omaha and Eastern Illinois at CIBER Field on the campus of the University of Denver in Denver, Colorado. Final score of the game was Omaha - 3 and Eastern Illinois - 1.